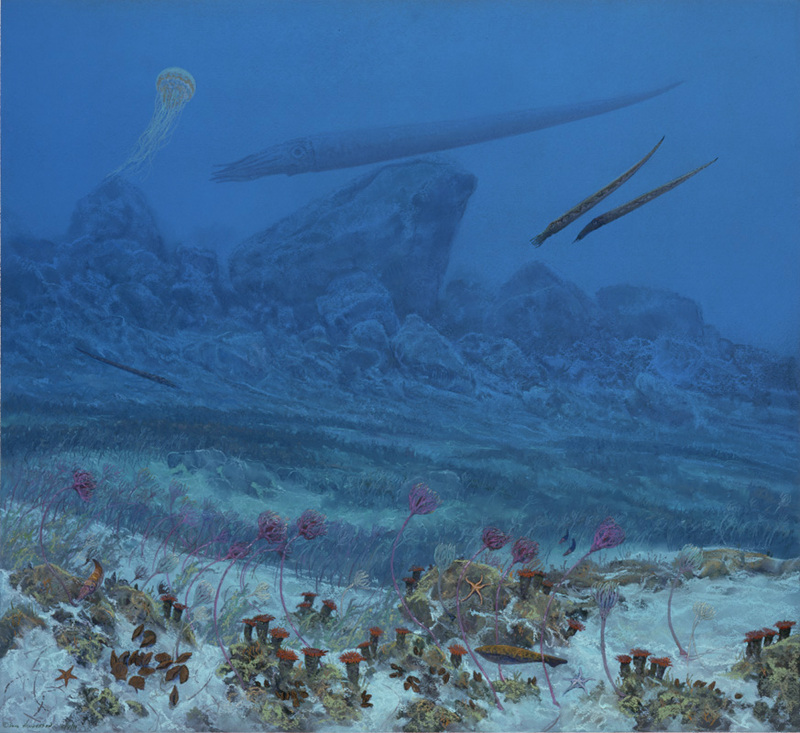 A seafloor landscape from the Ordovician of New York, some 400 million years ago. The image depicts an unstable sea floor on a continental shelf prone to mass slides of mud and boulders. Various species of crinoids, horn corals, starfish, cephalopods and a primitive jawless fish are examples of marine organisms buried during slide events. Pastel on 140lb watercolor paper, 20.125 x 23.125 inches, 2004. Commissioned by the Florida Museum of Natural History. 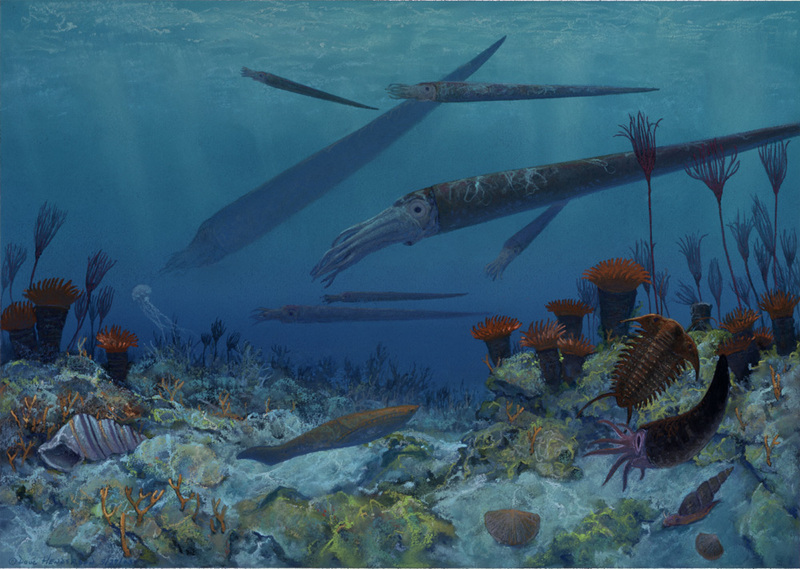 This illustration depicts an early primitive armoured, jawless fish, large straight-shelled cephalopods, a trilobite and some other invertebrate marine life of the Ordovician of New York some 480 million years ago. Pastel on 140lb watercolor paper, 12 x 17 inches, 2003. Commissioned by the Museum of the Earth, Ithaca, New York. 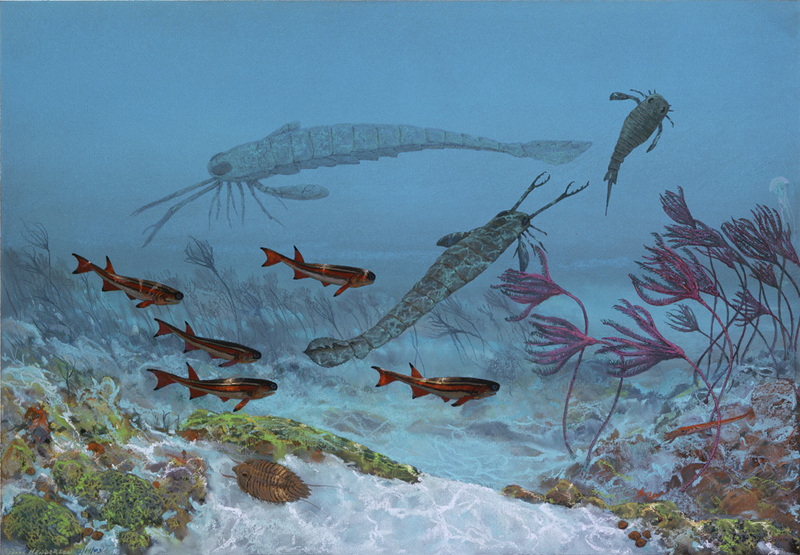 A Silurian marine scene from New York of some 380 million years ago, depicting two species of Eurypterids, various corals, crinoids, and primative jawed fish. Pastel on 140lb watercolor paper, 14 x 18 inches, 2003. Commissioned by Museum of the Earth, Ithaca, New York. 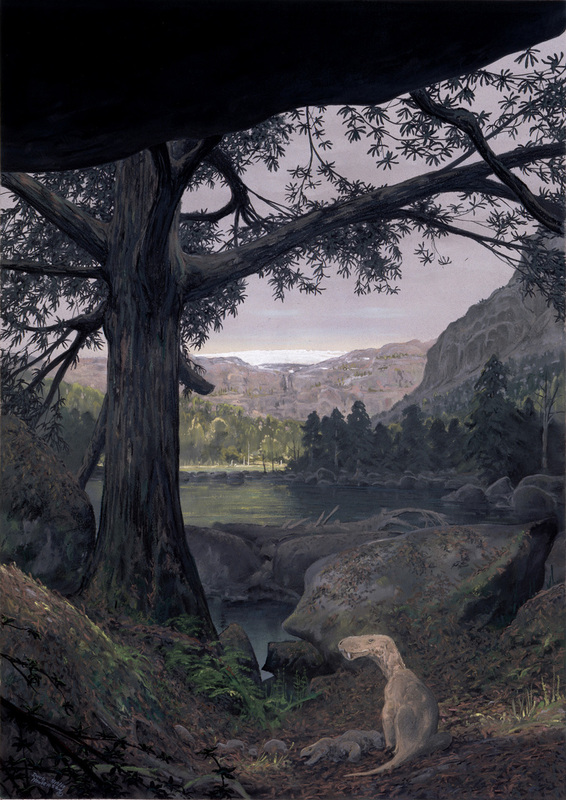 Depiction of a freshwater lake in New York during the Devonian, some 350 million years ago. Several Bothriolepis swim and forage for debris along the lake bottom together with a Coelacanth, as small Diplicanthus pass above. In the distance is Eusthenopteron, a large predatory fish with many anatomical features resembling those of early amphibians. Pastel on 140lb watercolor paper, detail from larger 20.125 x 22.25 inch work, 2004. Commissioned by the Florida Museum of Natural History. 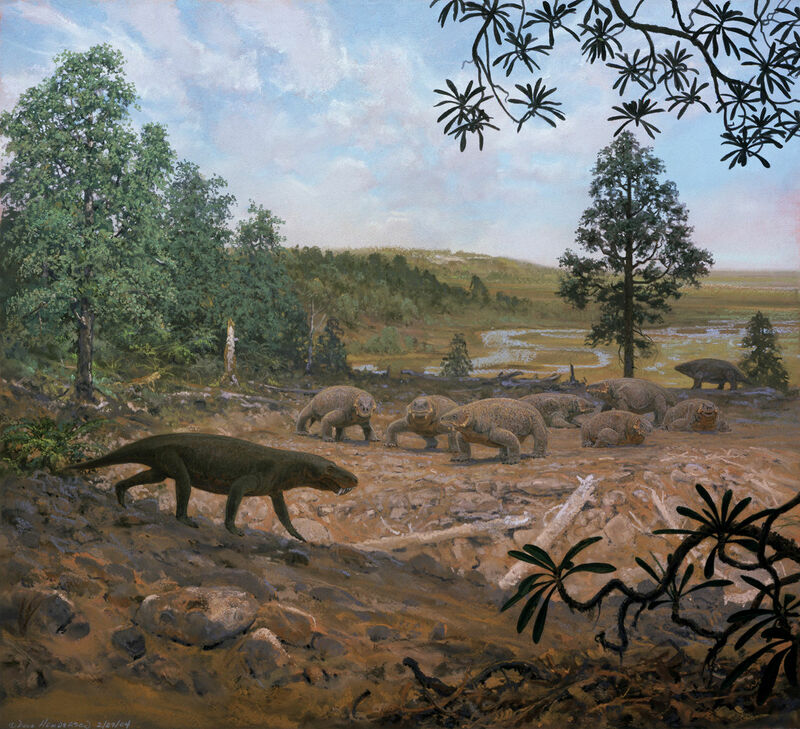 Scene of a freshwater lake environment in New York during the late Devonian, some 350 million years ago. The lungfish Fleurantia floats within roots of sunken proto-conifers as small Diplicanthus swim by in the foreground. In the background, an armored predatory arthrodire attacks Holoptychius, a large freshwater crossopterygian. 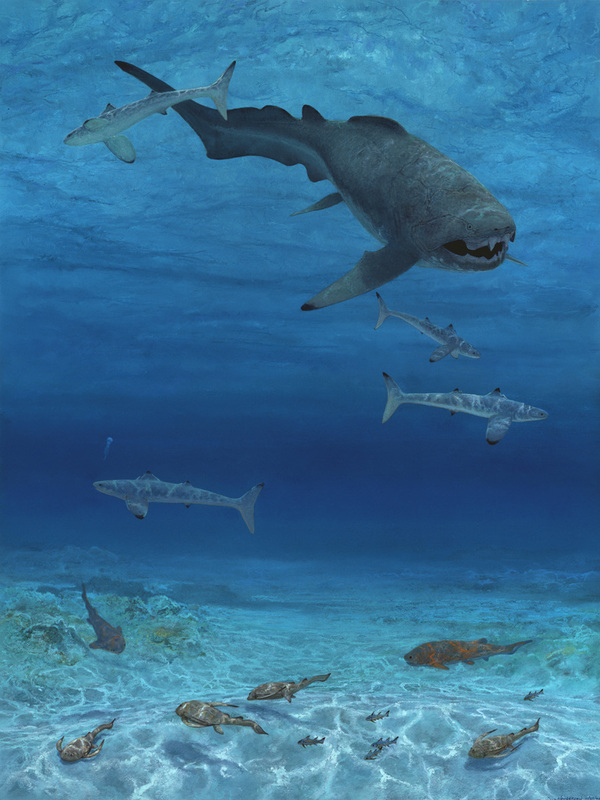 Dunkleosteus, a large, predatory arthrodire (armoured fish) patrols above several sleek-looking Cladoselache (early sharks), the armoured fish Coccosteus and a few bottom-dwelling placoderms, Brothriolepis. The very small fish are Diplicanthus. 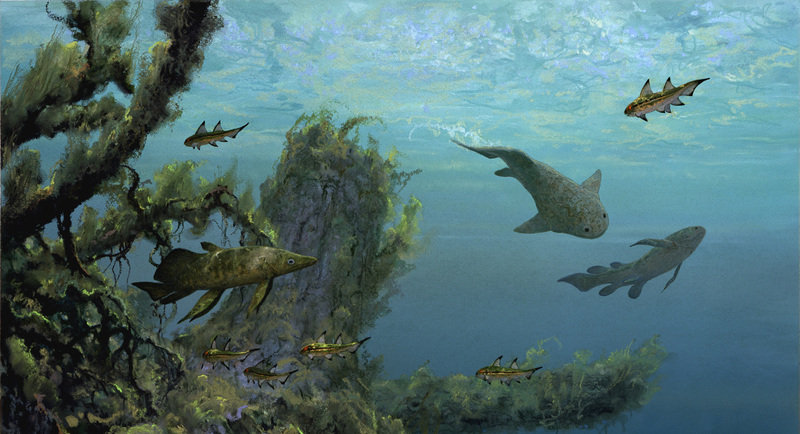 The image represents a selection of late Devonian marine fauna of New York of some 340 million years ago. Pastel on 140lb watercolor paper, 20.125 x 26.875 inches, 2003. Commissioned by Museum of the Earth. 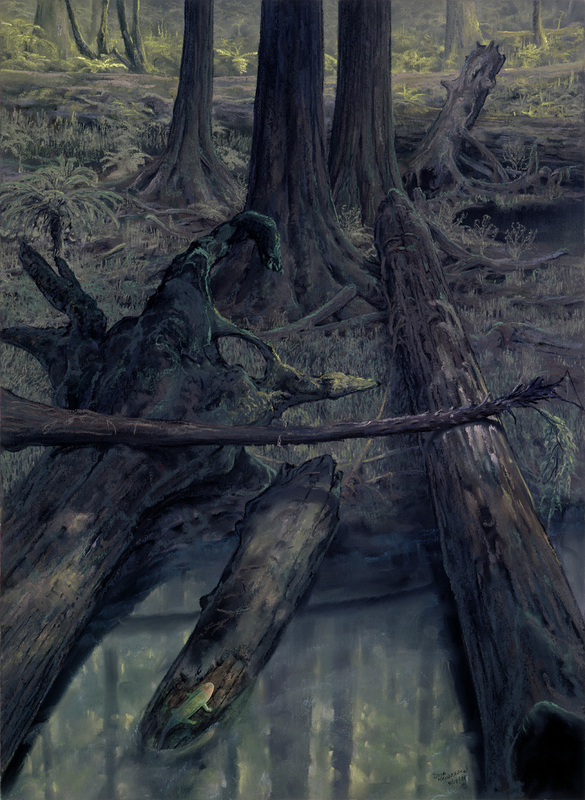 Depiction of the early amphibian Ichthyostega on the edge of a freshwater pond within a proto-conifer forest of large Archaeopteris trees during the late Devonian, some 350 million years ago--a time when the first canopy forests appeared on Earth. 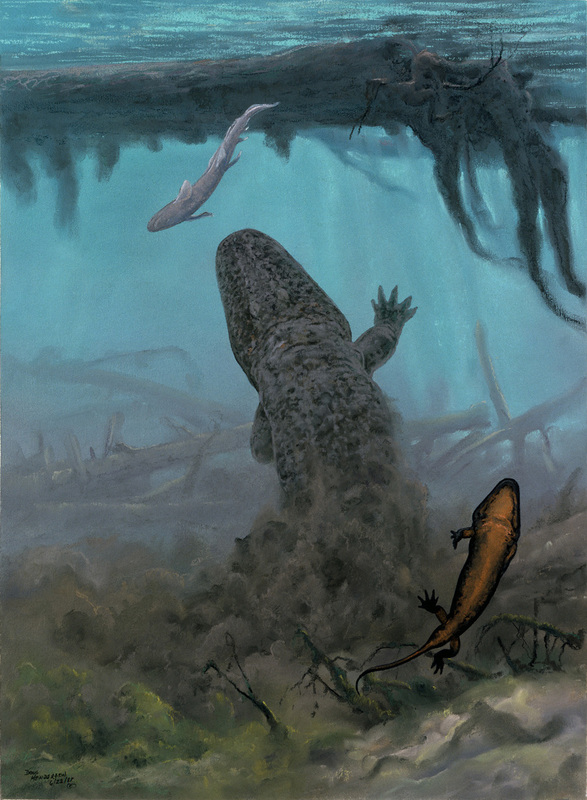 Since the 1990's, a reassessment of the fossil reconstructions for Ichthyostega now suggests this tetrapod probably was not as well suited for walking on land as was first believed and instead used its limbs for traveling over shallow stream and pond margins. Pastel on 140lb watercolor paper, 16 x 22 inches, 1988. From the book Dinosurs, A Global View, pubished in 1990. 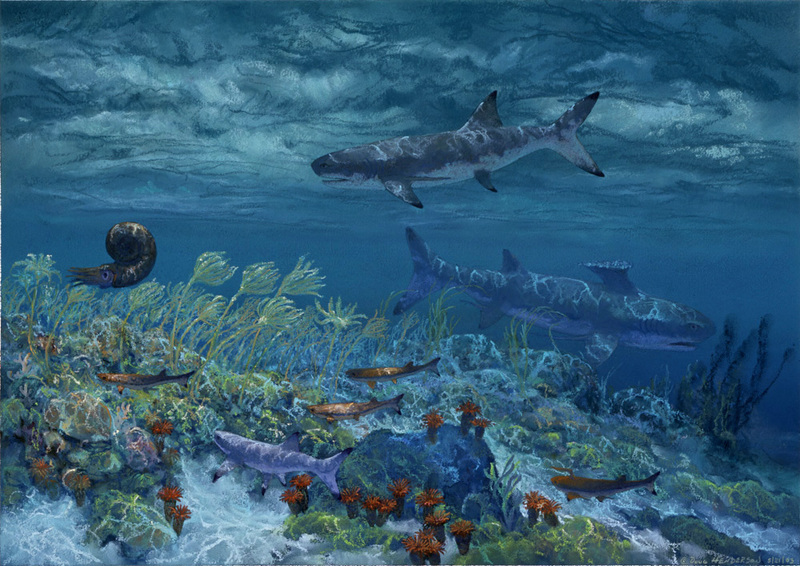 Two Carboniferous stethacanthid sharks, together with other smaller sharks and an ammonite, pass above various corals and waving forests of crinoids in New York seas some 300 million years ago. Pastel on 140lb watercolor paper, 12 x 17 inches, 2003. Commissioned by Museum of the Earth. 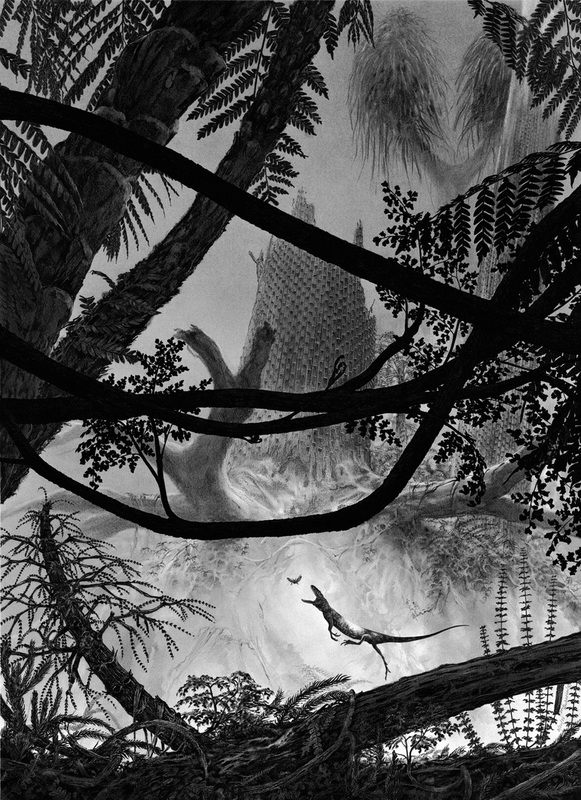 A depiction of Nova Scotia during the Carboniferous Period some 340 million years ago with the early reptile Hylonomus leaping for an insect in a coal age forest of tree ferns, seed ferns, horsetails and the large lycopod tree Sigillaria. Pencil and graphite dust on 2-ply bristol, 17 x 23.5 inches, 1988. From the book Dinosaurs, A Global View, pub. in 1990. 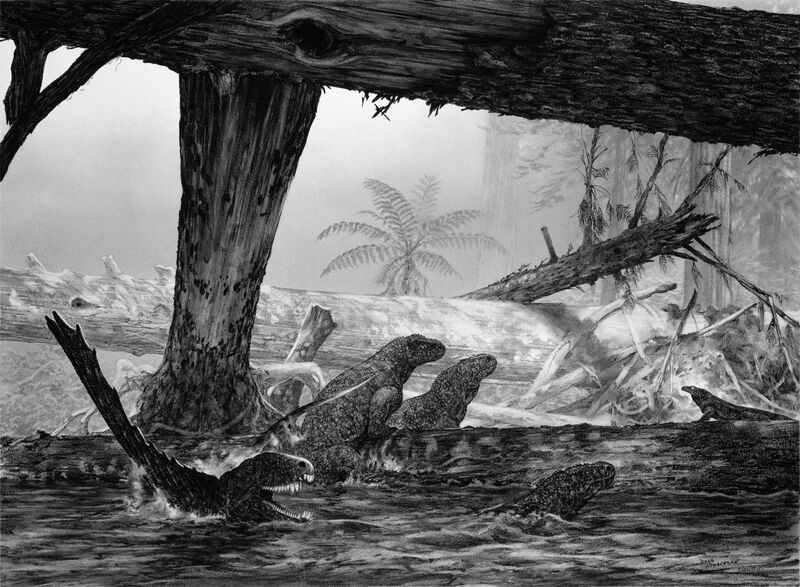 A depiction of Ophiacodons, early mammal-like reptiles, in a freshwater pond in Oklahoma during the Permian, some 280 million years ago. One has captured a lungfish. Pencil and graphite dust on 2-ply bristol, 12 x 19.75 inches, 1988. From the book Dinosaurs, A Global View. 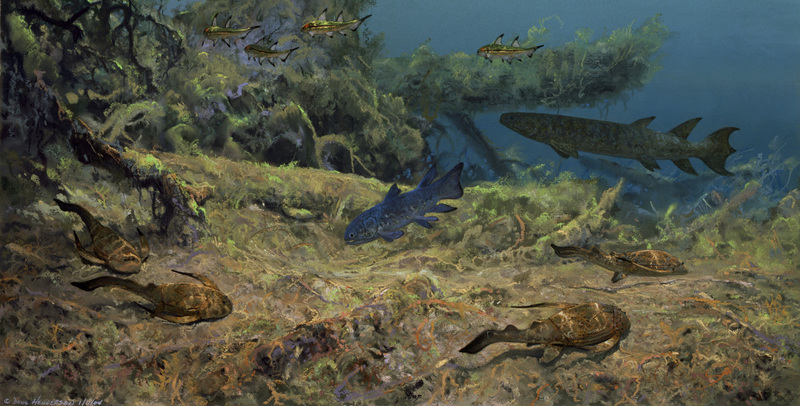 The large amphibian Eryops lunges from a muddy lake bottom to capture a freshwater shark, Xenacanthus, during the Permian in Texas, some 275 million years ago. A smaller amphibian, a Trimerorhachis, swims in the foreground. Pastel on 140lb watercolor paper, 14 x 19 inches, 1988. From the book Dinosaurs, A Global View, published in 1990. 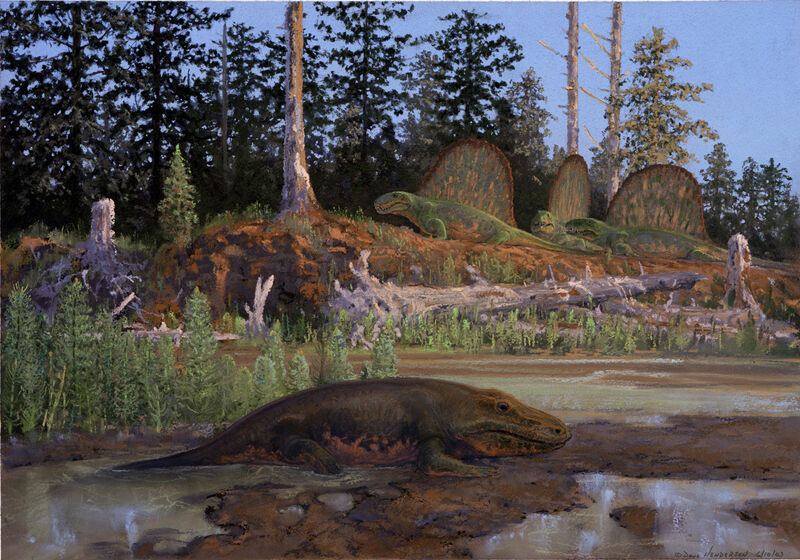 The large Permian amphibian Eryops with several advanced therapsid reptiles, Dimetrodons, basking on a distant hillside forested with early conifers. The scene represents the Permian Basin of Texas some 275 million years ago. Pastel on 140lb watercolor paper, 13.5 x 19.5 inches, 2003. Commissioned by Museum of the Earth. A Dimetrodon, an early mammal-like reptile, purses one of several Diadectes, a primitive plant-eating reptile, in Texas during the Permian, some 280 million years ago. A smaller transitional amphibian/reptile, Seymouria, is visible poised on a log. Pencil and graphite dust on 2-ply bristol, 15 x 20.5 inches, 1988. From the book Dinosaurs, A Global View. 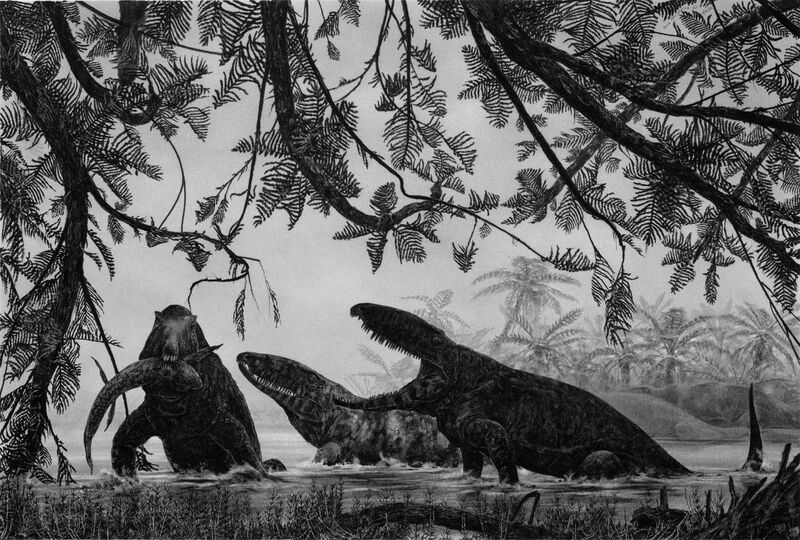 Dimacrodon approaches a group of Cotylorynchus excavating roots in a Russian forest during the Permian, some 260 million years ago. Pencil and graphite dust on 2-ply bristol, 14x 19 inches, 1988. From the book Dinosaurs, A Global View, 1990. 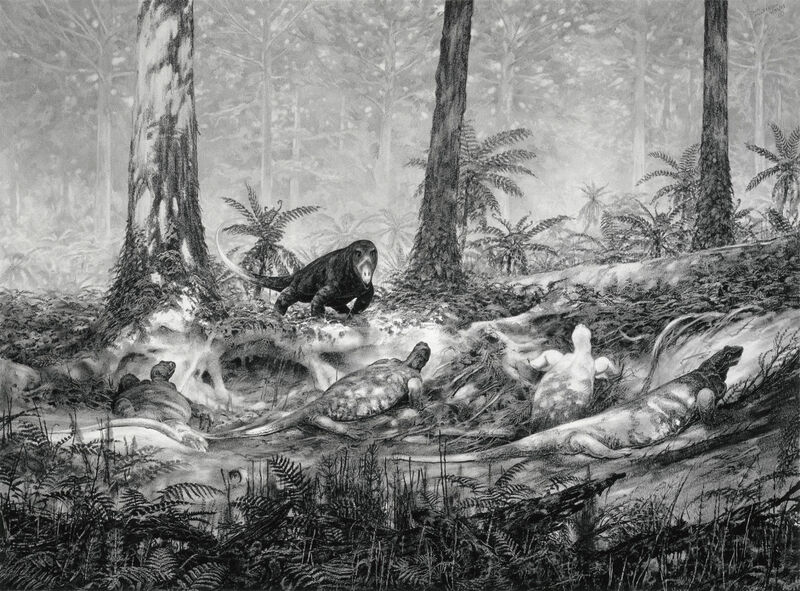 A late Permian scene in South Africa some 220 million years ago, as Lycaenops, a mammal-like gorgonopsid, sits over its prey, a small Endothiodon on the shore of a lake in a forest of glossopteris trees beneath a distant ice field. Pastel on 140ib watercolor paper, 15.5 x 22 inches, 1988. From the book Dinosaurs, A Global View. 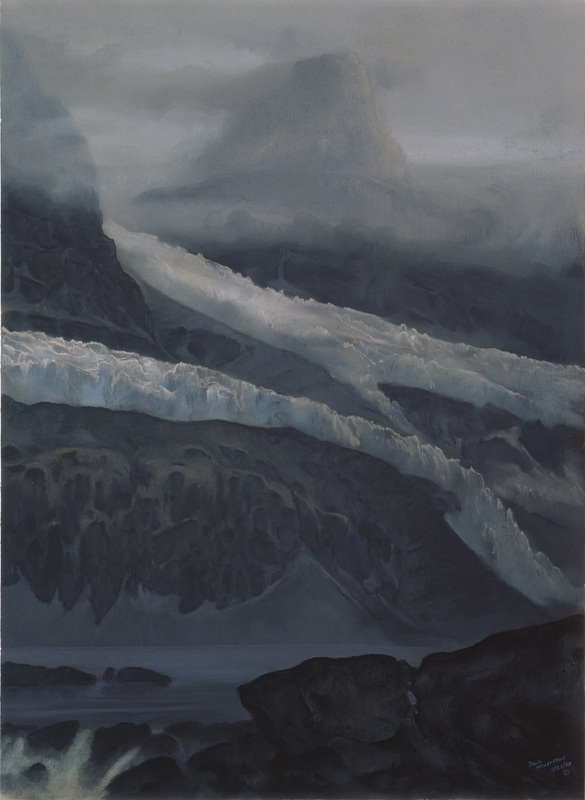 A glacier in southern high latitudes during a time of continental glaciation in the Permian. An arid, open forest of Glossopteris trees and Gingko stand above a broad river plain during the late Permian of South Africa, some 250 million years ago. The large, predatory mammal-like reptile Rubigea shadows a group of Bradysaurus, reptiles possibly related to turtles. The reproduction measures 12.3 x 13.5 inches. Pastel on 140lb watercolor paper, 20.125 x 22.25 inches, 2004. Commissioned by the Florida Museum of Natural History. A collection of illustrations related to the Cambrian, Ordovician, Silurian, Devonian, Carboniferous and Permian Periods.